In May of 2010 I attended my first ever comic book convention, and even walked away with an Iphone photo and autograph from the truly amazing actor and stuntman, Ray Park. I know celebrities, stars, and artists are really people just like us, but with incredible skill, or incredible luck. You have to admit, though, that there is something special about connecting with someone so accomplished, talented, and widely known. Recent discussion has me thinking about what makes encountering a celebrity so special to any particular person. From my own experiences I know that my fan stories are so exciting to me because of my history with that particular person or story. I have plenty, but my favorite encounter was with the ever-dashing Craig Parker of Lord of the Rings and Spartacus fame. The Lord of the Rings films have an incredibly special place in my heart, as so many important and worthwhile events, people, and choices in my life have been affected by the trilogy. As a child, and into my teen years, just about everything I had to say reflected back on the films in some way. In middle school, after the (SPOILER ALERT!) death of Haldir the Lothlorien warrior elf in The Two Towers, I would schedule weekly moments of silence in his remembrance during lunch in our school cafeteria. Strange, yes, but you can’t deny my dedication. 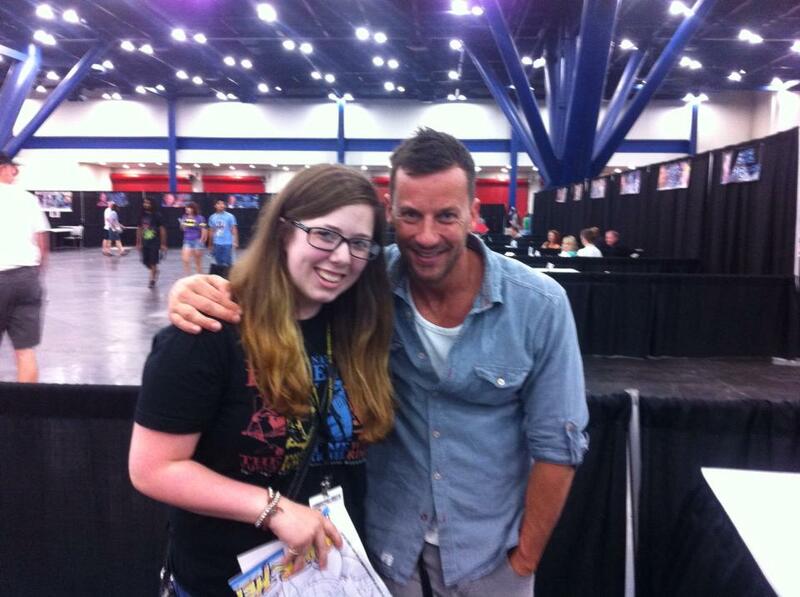 So, when Craig Parker himself appeared on the roster for Houston’s Comicpalooza convention, I was thrilled. No Lord of the Rings cast or crew member had visited the convention yet, and I had been eagerly awaiting for someone to be announced. With headshot in hand, I approached his booth and was not at all disappointed. I told him embarrassing stories of geekiness, and he apologized for my childhood trauma attached to his character’s death. If only the 12 year old me knew that I would have such a moment with Haldir. Afterwards, I attended his Q&A session and questioned him regarding his work with the legendary fight choreographer, Bob Anderson. Geeking out with him over Anderson’s skills and history in front of the crowd was exhilarating. Cat Trites of Taiwan had a similar experience with an actor she admires, Manu Bennet. Later during the convention, Cat had a photo op with Bennet, and he remembered speaking to her earlier that day. Possibly the largest genre for fan-love would have to be the world of music and musicians. The right song at the right time can make such a difference in someone’s life, and music is everywhere. From your car stereo to Spotify playlists, you’re bound to connect with a rhythm, lyric, or melody. Stephanie Connelly of North Carolina has a passion for music and a history of attending concerts and meet-and-greets alike. She reminisced with us over a moment she shared with Will Anderson of the band Parachute. Check out this form if you have a fan story you would like to share in our next installment. We look forward to hearing about your special meet-and-greets!